Does this mean goodbye to my solar panel, my 1KG lead-acid battery and the box full of cables I have? Does these mean that you won’t have to spend over $1000 on a Solar UMPC kit now? 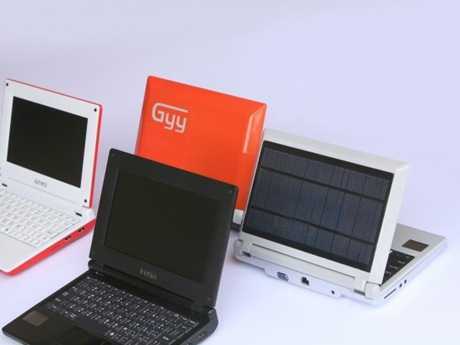 iUnika have announced a range of very low end, low-cost netbooks which include one with a solar-panel on the back. The price: $260. Here’s my take. Using a PC in the sun is hard work on the eyes and hard work on the battery as you need to pump up the backlight. The solar panel is also very small (I estimate 4W max output) so with a device that’s likely to be in the 3-4W operating power range, it’s at best, a trickle charger that can keep the device topped up when not in use. Putting panels on PC’s does a nice job of cutting out the losses you get when charging external power banks but they need to be detachable to get the best use out of them. Still, bravo to iUnika for doing this. There are definitely some customers that would benefit from this. Education in hot countries with poor infrastructure comes immediately to mind.